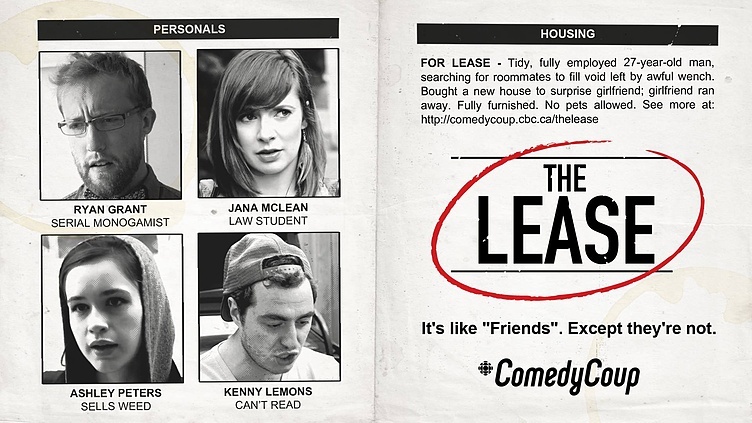 "The Lease" is a mockumentary about four random roommates. It's like "Friends". Except they're not. We chat about the show, the viral kijiji ad that launched the idea, and our favorite comments. Love your onesies and your "perfect joke". I didn't find this added much to your pitch, but, as a fellow couper, this hype video was a tough one, and you created a lot of hype from the kijiji incident, which was solid. Liked you guys from the beginning, still aboard. I really like the initial concept of the show, guys! Although this video seemed somewhat unprofessional with it's awkward cuts and drinking on camera. I am looking forward to seeing the outcome of this project though, because the idea is good and I like what you've done before this mission. Your Sell Sheet is very well done. It really gives us the sense of a reality. I think all your graphic work is above average. Way above. Keep it up. Those oneies look so comfy! Great idea for the show - having lived in some homes with a hodge podge of people, I know the silliness that could ensue. Good luck for the top 15. I like the premise, there's lots of room for wild and crazy stuff to ensue. The real key is the chemistry of the characters, I've seen some pretty boring room mates. You seem to have a handle on it. Good luck! Sitting talking to the camera has never been so interesting! Great onesie acting guys. The show looks like is has lots of potential. Very sociologically relevant. A lot of the audience will relate to this. I might watch it. Good luck. I liked that you had some jokes in there, but you probably could have fit more in about why the media should be interested in this project. Like the concept, I don't think we can ever have enough situational comedies like these. As long as there are interesting characters, and I think yours are, especially the female characters, we should see more of them in these mission videos... keep that in mind for the coming weeks. Best of luck! It's a great way to hype it and an interesting idea, I wish you all the best of luck because it is definitely something I'd watch despite being unsure of how funny it will truely be. You have a funny concept that you have delivered in a pretty interesting way. I am looking forward to more from you and I am interested in seeing how this develops. Good luck going on and keep up the funny. I liked your hype and I a curious how your party went and how many came out to hang with your guys. I like you 2 guys and I hope your get to the next level to show us more of your stuff. I like the concept for this show and the tag line always makes me smile, but I have to agree with what some other people have said about the use of the mockumentary style. I still think it could be a good show and I'll be interested to see more after the next round. Good luck! Newfs in onesies ... brings back memories. The characters have charisma! Nice concept as well! It is a good concept but I don't like the film style or the 'mockumentary' style. It just doesn't fit very well I think. Maybe with the budget you could very well improve it but of course that would be hard to do without winning! Good luck. The information was all there but the presentation for this mission was hit and miss for me. Overall I still think you are one of the top contenders though :) Good luck with your project. The crew is very create....looking forward to more! Good to see more of this. I can't wait to see what this crew comes up in the future. The quality is there, and the attention to detail. Well done on this one. Although I found the camera work in this one less than scintillating, I loved the humour and the personalities in this. Good luck guys! Great ideas! Good luck to "The Lease"!! Having had this happen, and having those random roommates end up being great friends, that journey is something that could be done well in a series. Good luck with the rest of the competition! When do we get to see a copy of the lease? The actual legal document. That would be interesting, maybe someone wrote their name wrong and then they got kicked out? I believe the hype. Well done! Only a bit of comedy in this weeks video, wanted some more laughs. A bit too chitchatty, but fun concept none the less. Keep up the good work guys! Good Luck you guys rock!!! Nice team, and a concept that could get a lot of mileage. Good luck! Nice onesies, boys. Lookin' super comf. Can't wait for the show and after party tonight!! Should be lots of fun! Nice work on this weeks mission! My pants almost came off at one point, luckily I was wearing lock ups. Reminds me of my hosteling days. Always fun to have roommates. The antics are endless. You won't run out of ideas. I get a kick out of the personalities playing off each other. That sounds like quite the parade you have going there! Love the jammies and the whole premise of the show. Live improv has potential for promo - best of luck on the 7th! You have definitely created an unusual mix of personalities with these roommates and I hope we get a chance to see more. You have lot of high power competition among the top 55 and I will be watching the voting results with interest. Good luck! Not sure we need another show about the difficulties people have living together but it could be good with the right actors and some strong writing. Good luck to you! Kijiji ad was awesome and I liked your approach with this video. The onesies look positively cozy. Question - where's the Republic - sounds like a good place for beer. Keep up the good work and best of luck this weekend - your friends at Fruit Farm. It's on Duckworth Street :) Closest to Mile One. I like the concept, especially as it was inspired by an actual Kijiji ad. It will interesting to see what you do with this. Congratulations on cracking the Top 55! This show would work if it weren't a mockumentary, that style has been way overdone lately. The sell sheet is a big childish, it would have worked better if you went with the newspaper theme that you've been going with the whole time. I'm also starting to think that you don't actually have a third member as she never appears in any of your vlog style videos. Hey there! I do really exist. I'm just traveling with my latest feature film, Relative Happiness, at the moment. Matt Wright & Mike Fardy are talented guys and I stand behind them. Thanks for the feedback, dude! I recently discovered that you can get Totoro onesies for adults. If you have those, it's an all ages show. I like the sell sheet and the concept. Need to know where you got the onesies big enough to fit the guys! I am rooting for all the shows set on the east or west coast - too much focus on Toronto already! Not sure why everything funny right now has to involve getting drunk, but, hey! to each his own, right? I DO like the onesies. And I DO like that you guys don't seem to take yourselves very seriously. Not bad stuff here. Looked like they have an idea where they are going. Your overall concept is great, but this particular mission did not appeal to me at all. The editing was poor and your presentation was a bit horrifying. The beer drinking and crotch spread while trying to sell your show was not at all attractive, overall it made the mood lazy. Good luck with your next mission! Good job you two, I liked the costume change! Seems like a fun idea, I love Friends so if this is anything like that, it will be great. Good luck with Top 15! Great job guys, loved the jammies! I saw the ad, someone had sent it to me, didn't realize at the time it was for a show, that was probably the best hype you could have done for the show. Would have liked to see a bit more footage from the show but overall great job. This really interesting! Sounds like a fun storyline and interesting characters. Like the effort for the Hype-it party. Good luck on Top 15!!! Hope to see you there Ben! Cool about the Kijiji ad. I like the premise of the show, definitely has a good hook. I felt like maybe this video was a bit too laid back for getting people "hyped" about the show. But I liked that the creators took the time to thoroughly pitch the project idea. Good luck! We felt we hadn't done that yet. Hopefully our earlier videos give you a better idea. Oh man I love the Kijiji ad. Brilliant! Excited to see how this plays out. If possible I'd love to see a recording of the live show for those of use that can't eb there in person. Be a great way to get a taste for it. the guys for The Lease did a great job explaining what the movie is all about. i like the story line, the relationship between men and women is sure to be a hit and funny. interesting idea to actually put a Lease ad - and did you really get that number of replies.??? 20k and counting. And some very silly emails. Thanks Diane! I liked the concept and the tone of previous videos, but the macho attitude and questionable comments about women in this one are off-putting. Also, you should be using every opportunity to showcase your editing and production prowess and that's missing from this video. You had some cool stuff going on before, don't back off now. It comes off as cocky. I certainly didn't feel macho in my girlfriends onesie. And I was trying to express that we wanted to have fully developed female characters and play with gender norms a little bit. For example - we see Jana as the dad, Ryan as the mom, Kenny as the baby, and Ashley as somewhat of a Bart Simpson type. I hope that clears things up. Thanks for a thoughtful comment. The concept is great, but you really aren't capturing the audience with this weeks task. Slightly boring and little humour....good luck. Those are some dope onsies. I like the christmasy one better. Where'd you get that? Like what you did with the kijiji ad. Great way to create buzz and build to the show. You were hyping it before ComedyCoup even told you to Hype it. Way to be ahead of the game. Sorry but editing wasn't very good. One of the guys talking didn't seem to know what show was about. Maybe it was the editing but to say that this show was about some guy who probably broke up with his girlfriend tells me he doesn't know. Maybe he should watch the teaser. Also not having one of your key people there makes me think. Not good. Sorry - Deanne is touring film festivals right now with her feature Relative Happiness. While we miss her she is always engaged via email and a valued member of our team. Still love the tagline, "It's like 'Friends' but they're not." Says so much succinctly. Cutting from button-ups to onesies and beers was funny. I want to read response to that Kijiji post. I want to ride a turtle! As someone who has spent the majority of their life living with roommates, I can definitely relate to the humor and antics portrayed in your show. It is a very accessible concept and I think you've done a great job of keeping it interesting and unique. best of luck. Having roommates live in your house sounds like it would be an interesting experience. Good luck with your videos in the competition. Not as crisp as your trailer but I like the humor and laying everything out about your show clearly. And who doesn't love a onesie. Best of luck. I'd like to see more about this show. I really like the concept and think there's a lot of room in here for relatable and funny comedy. Its what we're going for. Very character driven. This sounds like a concept a lot of people can relate to. I have liked your show concept from the beginning, however the video was lacking in enthusiasm for selling your project. I think the the sell sheet was lacking in something too. We will be less chill in the future. Thanks! ( how do people ) not pope!?!? getting drunk was a good closer but always be sure to hype some grub to go along with it - and localize it a bit more and explore neighbourhoods ( good/bad) and mythologies/icons of your fair city and province. and how pope there make it through the winter! do people - not pope! I like your premise but also agree with what Sadie (see below) said. The video this week was pretty casual for this late in the game. I think you will need to bring it up a notch to keep us all interested and coming back. Come to our party tonight. Lease, Lease, Lease, Lease, Lease, Lease, Lease ,Lease. AH I wish I could have made it to your party! Hope it was a blast Pat! We'll be there! SO EXCITED! Really like the onesies, have not seen these in any other videos. The explanation of the show was very interesting and makes me want to see more. Looking forward to seeing more of this show. We also liked the onesies! We're still wearing them! I really like the premise of this show, and I think it has a lot of potential. The "hype it" really seemed just a little too casual and relaxed for this point in the game. Best of luck, because I really do want to see this show move forward to the top 15! It was super relaxed! We were hoping to make the focus shift to the content but I agree it could have been more dynamic. Smiled at the switch to onsies. Liked that. LIke your accents, natural, not over-done, real. Rough cuts though. Good luck! That's how we talk! Thank my parents and those who have drifted in and out of my life for 26 years. Thanks Laurie! The onsies certainly served us well. Thanks for the feedback! Great jokes, onesies, and overall video. I thought you were very clear in telling the media what your concept is all about and also your upcoming event sounds like it's going to be a great night. Thanks Christina glad it went over well! We're very excited to party with the supporters! I would have like to know more about your show and some more back story, but I like the idea and can see it being a show. Hope you make the top 15, good luck! Thanks Jen! We hope we get another opportunity to talk about the back story 90 seconds just flies by! Hmmm. You didn't tell me anything about the show I didn't already know. The casual quality of this video felt kinda slacker. That kind of humor doesn't draw me in. Sorry onesies. I would, however love to hear more about the fake kijiji responses. We went super casual it true! We hope to have you tuning in so soon! Thanks Julia! They sold me with "Get Drunk"
That's how we sell most of our ideas! Love this week's video. You two guys are a great comedy team-you feed well off one another. I thought The onesies were a great idea and make a memorable media event. The show and after party should be a blast. Looking forward to more videos. A good idea with solid people on the project but it strikes me as a tough concept to keep going. Is this really going to be much different then Friends, Seinfeld, or any of those many comedy shows where young people struggle to live together? Will it suffer or benefit from being in a smaller town than NY? Hey Andrew! We've learned that a strong concept is something that's familiar but different. We wanted to create a show that's easy to make with fun and engaging characters to pull it through week to week. Looking at the shows you referenced you won't find a whole lot more than 3-5 go-to recurring settings and with a city as colorful and unique as St. John's we'll have no problem finding engaging content from their surroundings! Great questions though these are great points to think about! I really like the way you set this up! The hype video was casual and engaging to the point of making me want a onesie. The sell sheet, on the other hand, is very tight and clear as to the direction you'll take the show. Great combo. Loved the kijiji ad! Thanks Liz! Glad you're on board. You are growing on me....the onesies are particularly cute..a Newfoundlad phenomenon? ?? ?.You have a good concept for a show and I only wish I was closer to drop byfor the afrer party...good luck. We do that! We're like a nice comedy-soaked moss! If you can make it we'd love to see ya! Love that! We'll credit you as a title consultant. Our people will talk to your people! I liked your 5th week video. You have me interested in watching for more. Thanks Colleen! We're interested in making more! Lots of potential for this show! This video could use a little oomph. I enjoyed meeting your team in previous weeks and think it would have been good to include them this week too. Good luck guys! We're saving the oomph for the after party! We love our team too but they are busy bees! Gotta pay them bills. Sorry for the chop but glad you like the concept! your sell sheet is a little dry, doesn't really draw you in. The video is also kind of dry but I love the onsies! This project makes me wish I lived out on the east coast. Love the idea, love the characters. I'm sad I'll have to miss your hype event, but I'll have a beer or two for you out here in Calgary! Good luck with the contest! We'll cheers the prevailing winds for you! Thanks Kaine! Thanks Jennifer! Yonce knows best so we know who run the world (girls). Thanks Sheldon! Sounds like we have very similar interests!